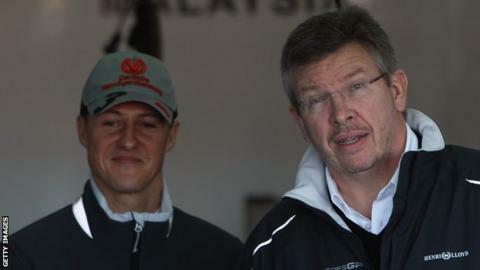 Mercedes team principal Ross Brawn says Michael Schumacher is the greatest Formula 1 driver of the 21st century. The seven-time world champion, who has announced his decision to retire at the end of the season, claimed five straight titles between 2000 and 2004. The 43-year-old first retired in 2006 before returning to Formula 1 with Mercedes in 2010. "I think he's the greatest racing driver of this century," said Brawn. Schumacher's second stint in the sport has not gone as well as he would have liked, with the German managing just one podium finish, at Valencia earlier this year, in three seasons. However, Brawn says that he has played an important role at Mercedes behind the scenes and believes he will have made a key contribution to any future success the team enjoys. "Michael brought a lot to the team in this second period that people don't see," he added. "We haven't achieved what we wanted to together and that's frustrating but what we do achieve in the future, Michael will have made a contribution to it." Mercedes motorsport boss Norbert Haug added: "I thank Michael. We have known each other a long time; we started together in Group C racing and he went on to be the most successful driver in Formula 1, winning more races and titles than any other driver. "We were competitors against him [when Schumacher was at Ferrari with Mercedes supplying McLaren with engines] and we had always dreamed of working together and it came after Brawn Mercedes won the World Championship in 2009. "We did not achieve what we wanted to but Michael has laid some strong foundations and I want to thank him from the bottom of my heart." Ahead of this weekend's Japanese Grand Prix, Lewis Hamilton, who will replace Schumacher at Mercedes from next season, paid tribute to Schumacher, describing him as a 'legend'. He said: "He has contributed so much to the sport, achieved an incredible amount and it is surreal to think I was waking up each second Sunday, watching him in races and then to have have had the chance to race with the legend and see him come and go." Red Bull's Sebastian Vettel says he will miss Schumacher's presence both on the circuit and in the paddock. "It's a big loss. It's a shame," he said. "There are a lot of people who would have loved him to continue, including myself. "I hope he stays around in some other function so at least we get to see him from time to time."